While the world was waiting for Samsung to announce its foldable phone, Xiaomi’s co-founder Lin Bin teased their own version of a foldable phone, a little over a month before Samsung’s official release. Since then, we have seen the Galaxy Fold and Huawei’s Mate X as the only two options when it comes to foldable phones. Early on Thursday, a new video featuring Xiaomi’s unnamed foldable phone was posted on Weibo. Xiaomi has not revealed any information about the possible features or specifications. Through the new video, we now know that the company will implement gestures based inputs which is how users will interact with the large tablet-sized display. Unlike the other two phones we have seen, both the sides on Xiaomi’s foldable curve inwards which is why the crease, if any, lie on the sides. The 10-second video shows little that’s new about the Xiaomi foldable. Interestingly, the user interface on the phone seems pretty optimized as it did not show any signs of frame drops or lags when it was folded in the video. We have a couple of reports that indicate that the Galaxy Fold has some issues re-rendering pages on Chrome when it is folded and unfolded. Even then, it is possible for Samsung to roll out software updates that will rectify the issues. 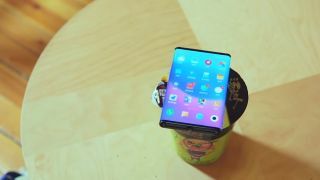 It is expected that Xiaomi will launch its foldable phone at around the 1000-dollar mark which is half of what the Galaxy Fold and Mate X cost. If that comes to be true, Xiaomi would enter the race of foldable smartphones and their’s might be the most affordable option out there.